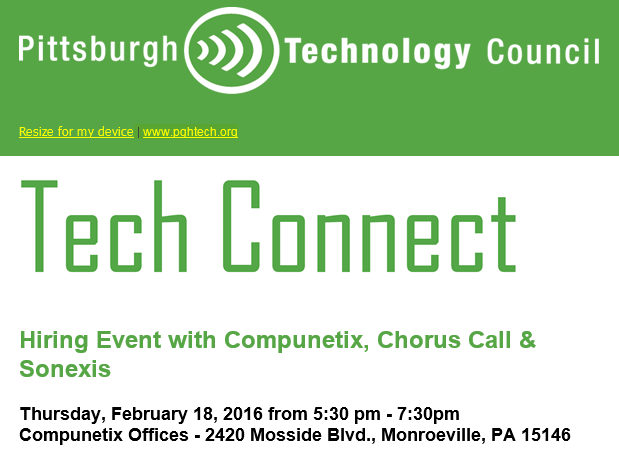 Compunetix, Chorus Call, and Sonexis are looking forward to hosting a job fair in conjunction with the Pittsburgh Technology Council on Thursday, February 18 from 5:30 pm to 7:30 pm at our Monroeville headquarters. The event is uniquely designed for job seekers to get a behind-the-scenes look at the cultures of our companies and provide an opportunity to meet with a variety of employees and hiring managers. Apply to attend this event by clicking here and filling out the form and uploading your resume so our companies can pre-screen candidates in advance of the event. The PTC will communicate with you prior to the event taking place to confirm your attendance after an opportunity to review the resumes. Please view the individual jobs above to read through the job descriptions to determine if you are qualified for one of these roles. *Note that by registering for this hiring event you are taking the first step in the hiring process. If you cannot attend please let Justin Driscoll know as soon as possible at jdriscoll@pghtech.org.